Every one of us at the Architect of the Capitol, in every job we do, uses tools to serve, preserve and inspire. Many of the tools we use here are unique, historic and essential to our mission—in other words, they are cool tools! We asked employees to submit their coolest tool, and this feature represents the coolest tool we found. 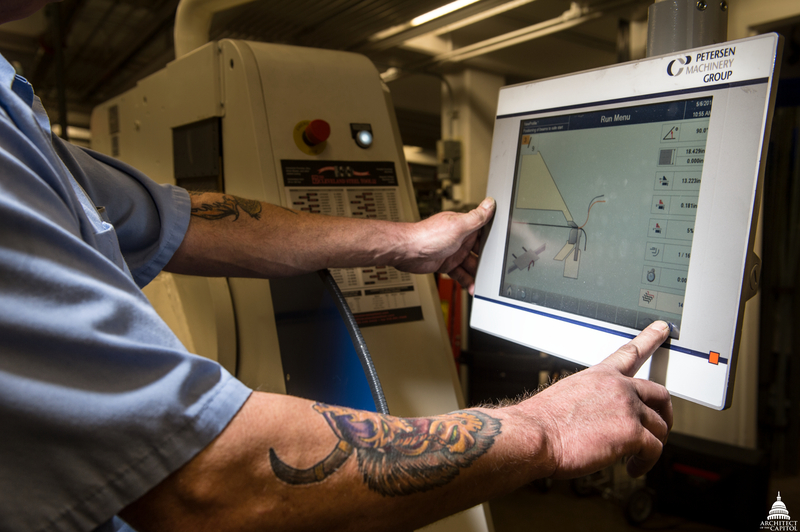 The U.S. Capitol Building Sheet Metal Shop introduced a new auto brake machine which offers an unprecedented capacity to bend metal that is integral to the many renowned projects around the U.S. Capitol. What is an auto brake? It's a metal folding machine that shapes flat metal into curved pieces and other elegant shapes with precision. At 9,470 pounds, our auto brake is so large that it had to be dismantled to fit into the Sheet Metal Shop, where it was reassembled. 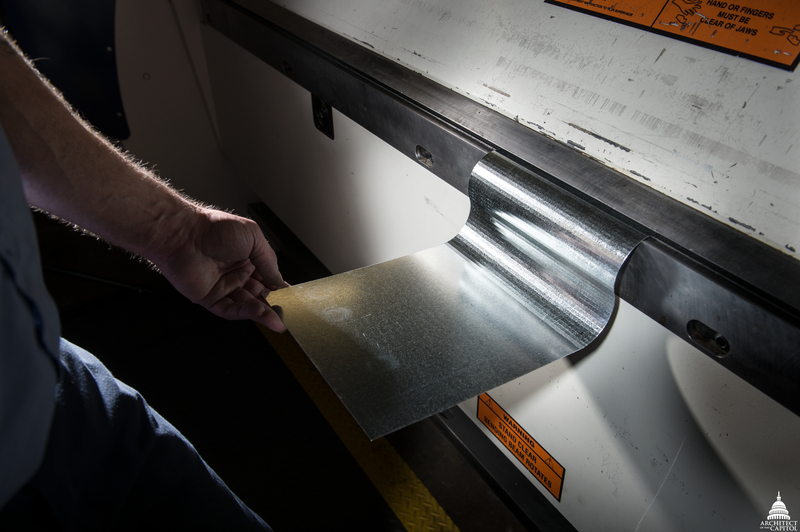 The machine's vast capabilities stems from our employees' expertise. The profiles and dimensions of metal can be stored in the machine using a touch screen computer. This means our mechanics can instantly access an extensive catalog of designs. Electronically stored diagrams save precious time that was previously spent sorting through hundreds of paper copies and manually recalling historical diagrams. 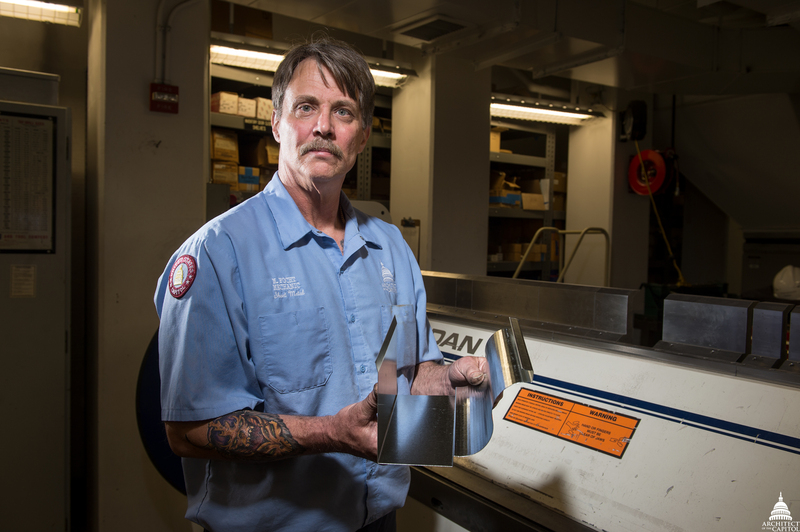 Mark Focht, Capitol Building Sheet Metal Shop, shows a section of gutter he created with the auto brake and demonstrates its use. Equally important, the old manual brake required two people to operate. The automated version can be operated by just one person. A foot pedal provides direct operation of the brake while drastically minimizing the likelihood of hand injuries. "Thanks to the forward thinking of our staff, we can use new technology to replace the old way of working and do things more accurately," said Capitol Building Deputy Superintendent Kristy Long. The auto brake helps us reach new levels of productivity and reduces safety hazards and cost. It's no surprise that we think the auto brake is a cool tool. As a retired construction project manager, I appreciate the time and talent needed to produce these sheet metal works that in past times were all done using hand brakes, snips, and tongs, but most of all was the true craftsmen that loved their trade. I ADMIRE THEIR TALLENT.